AWANG (Nov 11): Mah Sing Group Bhd will be rolling out its third township project in Rawang, Selangor called M Aruna in the first quarter of 2018. Mah Sing’s first two townships in the area are M Residence and M Residence 2. M Aruna will be on a 96.7-acre leasehold site and has an indicative GDV of RM520 million, Mah Sing CEO Datuk Ho Hon Sang told EdgeProp.my. “M Aruna is located at the west of the busy Rawang town centre. However, it is just 4km away from the main junction right after the Rawang toll plaza on the North-South Expressway,” he added. Given the serene yet convenient location, M Aruna will be positioned as a “secret garden” in Rawang. 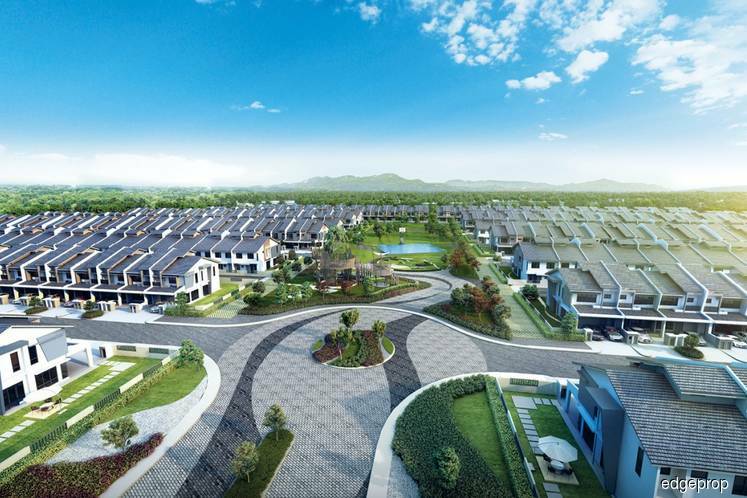 “We came up with the concept because of the peaceful natural setting with a beautiful mountain view, which is only a short distance from the busy town centre and main road,” Mah Sing sales and marketing general manager Angela Chong explained. On top of its natural attributes, about 10% of the land will be allocated for parks and green spaces. “M Aruna will provide a green sanctuary that promotes sustainability within the township. This is in line with our goal to reinvent spaces and enhance life,” said Ho. The township will feature fairy-tale-like thematic landscaped areas. There will be treehouses, hammocks, a jogging track and a half basketball court. It will have open green spaces outdoors and fully open-plan concepts indoors, providing more space for family togetherness. “Our central garden is about 2 acres and the rest [of the green spaces] will be pocket parks,” he added. “The central garden will be located right at the entrance of the township so everyone who enters will be immediately greeted by the greenery. The central park will also serve as the common area for the community to mingle,” Chong said. She added that 80% to 90% of M Aruna’s properties will be low-rise residences including 2-storey link houses as well as 3-storey townhouses that are under the government’s affordable housing scheme. There are also 20 double-storey shoplots to serve the residents. The entire project will have over 800 homes and is slated for completion by 2022. Chong said the landed property will be developed over three phases. The first phase will be rolled out by 1Q18. The first phase consists of 196 2-storey link homes with the size of 20ft by 60ft. The selling price starts from RM550,000. “We are targeting first-time homebuyers who prefer landed homes not far from Kuala Lumpur city centre. This is also why the land area size is slightly smaller than the other similar homes in Rawang, so first-time homebuyers and small families can afford to buy,” Ho said. Meanwhile, phases 2 and 3 of M Aruna will be launched sometime in 2Q and 4Q next year, respectively. Ho said Rawang is a matured township. Infrastructure upgrading works have been initiated by the Malaysian Public Works Department, while more international schools and companies have set up businesses there. “These are very good indications that the area is coming up. Rawang is no longer the quiet suburb. It is very well-connected today and its population is growing. We see strong demand for landed affordable properties from the locals as well as beyond Rawang, as seen from our previous two landed housing projects,” he added. Mah Sing has started taking registrations of interest for the project since the middle of this year and it has received strong interest, according to Ho. The sales gallery of M Aruna will be open on Nov 11. This story first appeared in EdgeProp.my pullout on Nov 10, 2017. Download EdgeProp.my pullout here for free.